Theatre for a New Audience enables bold and innovative artists—such as Peter Brook, Trevor Nunn, Julie Taymor, and Darko Tresnjak—to interpret Shakespeare and other classic works. Ticket sales account for a small portion of our operating costs. By making a tax-deductible donation, you will help Theatre for a New Audience as we realize the visions of some of the finest artists working today. Members receive benefits that augment their theatre-going experience while supporting groundbreaking productions at Polonsky Shakespeare Center. For more information on supporting Theatre for a New Audience please contact James Lynes, Director of Institutional Advancement at 212-229-2819, ext. 29 or by email to jlynes@tfana.org. 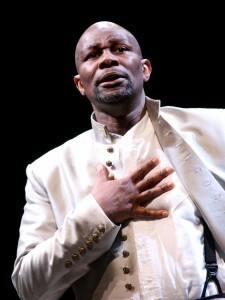 John Douglas Thompson as Othello. Photo by Gerry Goodstein. For information on making gifts of stock, corporate matching gifts, or gifts in honor of/memory of a friend or loved one, click Other Ways To Give. * Discount can only be applied to full-price tickets ($90+) and cannot be combined with other offers. Not valid on premium seats. **Limited to four single tickets or two subscriptions; one transaction per season. ***Must be reserved in advance; subject to availability.Pictured above: Polonsky Shakespeare Center, photo ©David Sundberg/Esto.